A high quality alternative to hand painted oil and acrylic paintings on canvas are acrylic glass prints. Thanks to a special overmoulding process with synthetic resin, the images feature unique characteristics such as sharp expressiveness and a high-gloss appearance. Our artists specialise in acrylic glass prints in vintage style, as this is the design that best expresses the technique. The characteristically brown nuances of vintage style painting shine especially bright under the acrylic glass. Bring out your nostalgic side and decorate your dining room or hotel with exclusive, vintage-style acrylic paintings on glass. You’ll leave a lasting impression on your guests with your courage to select extraordinary works of art. with artistic allusions to their natural habitats. You might miss the intricacy of the design at first glance, but trust us — it’s definitely worth a second look! It’s an impressive sight as the depth of the motif reveals itself before your eyes. KunstLoft is committed to the idea that valuable art should not be a privilege enjoyed by an elite circle of collectors, but rather something accessible to everyone. We offer artworks at varying price points. 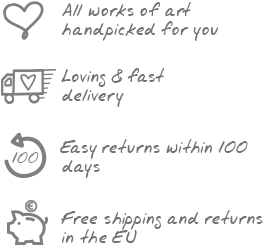 For our handmade acrylic paintings and handcrafted acrylic glass prints, this depends on the size of the artwork. You’re sure to get inspired by browsing through our popular sizes — no matter whether you find a small or impressively large-format painting. With high-quality acrylic glass prints, you can embellish the wall of your living room or office in the twinkling of an eye! The acrylic paintings on glass feature a crystal clear surface with a high colour brilliance due to the special way they are sealed with synthetic resin. These artworks are the perfect alternative to handmade paintings!